Only 18 months ago, if you wanted a simple but excellent and traditional Pho or Bun dish and lived in the Burnaby Heights neighbourhood, you had to get into a car and drive else where. As a result, I welcomed the arrival of Thai’s Saigon Bistro to the Hastings Street corridor in North Burnaby. The eatery opened its doors earlier in the year, serving the typical Vietnamese fare in the region but in a bright and modern dinning area (in comparison to typical Pho joints). To be honest due to its name, at first I thought it was a Thai restaurant, which is ballsy since Chad Thai, is directly across the street. Then I thought it might be Thai & Vietnamese fusion cuisine. However upon gazing upon the menu I realized it was just a Vietnamese restaurants serving up the classic dishes Vancouverites love. 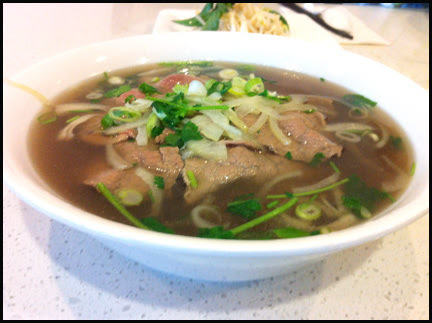 The Pho served here has a good soup base, which is the most important component when it comes any noodle in soup dish. It was light, seasoned well and most importantly for me, the restaurant either does not use MSG or does so sparingly as I did not fell ill or thirsty after my meal. The bean sprouts and basil provided was fresh. The beef slices were a little chewy but other than that it was a solid bowl of Pho. The shredded pork salad roll had a good balance of ingredients and was not just filled with tons of rice noodles. The shredded pork had the right bouncy texture derived from the pork skin and smoky flavour from the toasted rice flour. I liked that Thai’s Saigon Bistro uses green leaf lettuce instead of iceberg. I’m a sucker for deep fried chicken regardless of the cut of meat. 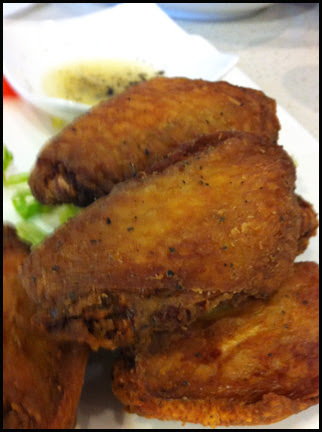 The fried chicken wings here are crispy on the outside and juicy on the inside. On its own it’s under seasoned but combined with the pepper, salt and lemon juice dip the wings are tasty. On a second visit I decided to get a bun entree (noodle bowl) consisting of grilled pork, deep fried spring roll and shredded pork. In addition a large serving of shredded lettuce, cucumbers, bean sprouts and pickled julienne daikon and carrots was given. To top off this generous sized dish were fried shallots and crushed peanuts. The pork was seasoned well and I could taste charring on the meat. 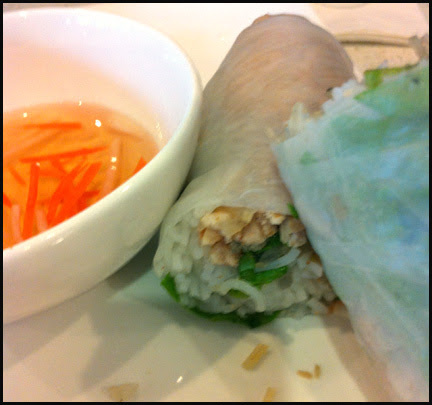 The spring rolls had bits of glass noodles and shrimp in its pork filling and was delicious. When all the ingredients are mixed together, whether you get the fragrant taste of fried shallots, crunch and tartness from the slivers of pickled carrots entwined with the soft vermicelli rice noodles or a toasted taste and bouncy texture of the shredded pork contrasted with the nutty taste of the crushed peanuts, every bite is a little different from the last but full of flavour and texture. 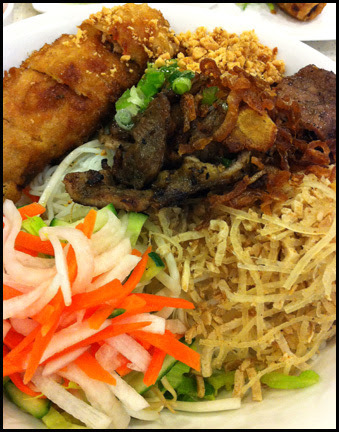 This is the reason why I love this particular Vietnamese item and this version I ate was great. The bun bowl had fresh and well executed ingredients in the correct proportion. The cooks were not skimpy with the meat or vegetables. I really enjoyed my meals at Thai’s Saigon Bistro, especially the bun dish. I’m happy I no longer have to drive to have a good Vietnamese meal and can just walk out to this eatery run by a very friendly family.